How to clean that hyper-v mess? I just want to delete all of them. I tried deleting the regedit entries and got a permission denied. HKEY_LOCAL_MACHINE\SYSTEM\ControlSet001\Enum\ROOT\VMS_VSMP\0002 - RegSetKeySecurity Error : 5 Access is denied. HKEY_LOCAL_MACHINE\SYSTEM\ControlSet001\Enum\ROOT\VMS_VSMP\0002\Properties - AddAce error : 87 The parameter is incorrect. You want the "remove-vmnetworkadapter" cmdlet in PowerShell. Merely looking at Device Manager will only allow you to add or remove device drivers from "devices" in the machine, where in this case the device is virtual. Then you can find the ones that you don't want and delete them with remove-vmnetworkadapter. Once the virtual switch stops reporting them as NICs in the machine, they'll disappear from Device Manager. In newly opened Device Manager "Uninstall" option in context menus worked for me (Win10 Pro). Must say I tried the netcfg -d from prior to this, but it had no observable effect. Also I had Hyper-V disabled at the time of this process. This WILL DELETE all network adapters AND network SETTINGS! Physical adapters will NOT be LOST. Then i restored my network settings and created new External Virtual Switches. This worked for me fine and fast. if that doesn't work. right click on the adapter, properties. Click on Configure at the top, on the 3rd tab on Driver. Uninstall the driver and close the mask. the problem should be solved after pressing F5. Not the answer you're looking for? Browse other questions tagged hyper-v or ask your own question. 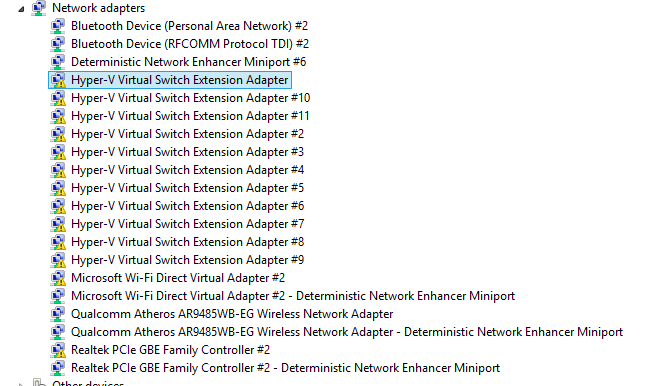 How to access device manager in Hyper-V Server 2008 R2?